Hot off the press from Sindabezi, a private island in Zambia. Murky Zambezi waters and rugged wilderness surround the only luxury bush camp in the Victoria Falls region, known as Sindabezi. 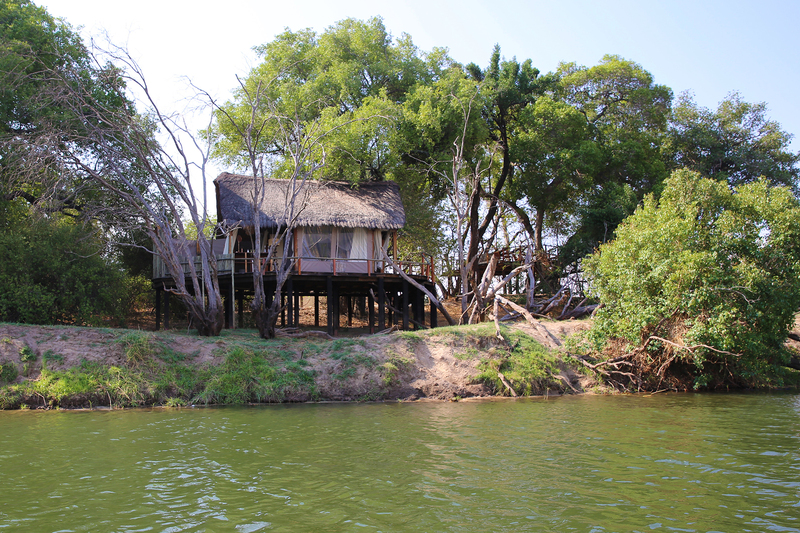 This property sits on a private island and is sandwiched right between Zambia and Zimbabwe’s national park borders. 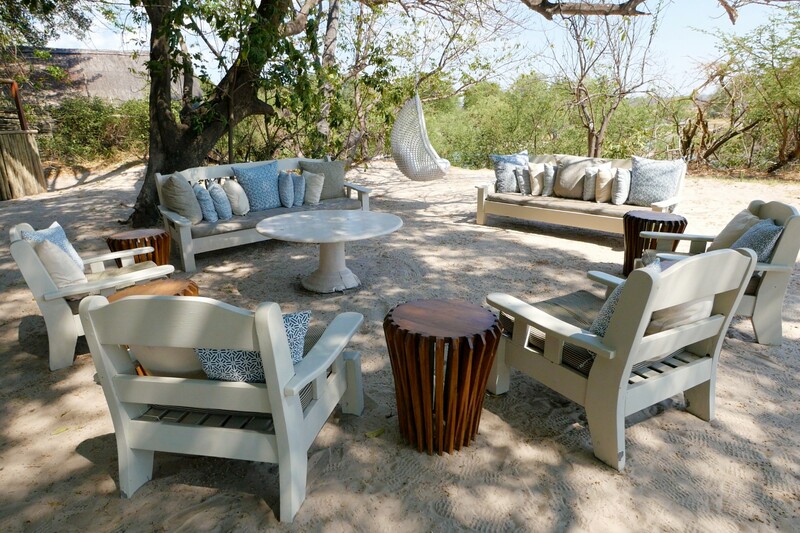 It is comprised of 5 waterfront luxury tents or “chalets” which are centered around an open-air lounge area. The remoteness of the location provides a vantage point that is unparalleled. It is a 20 minute boat ride away from the nearest civilization making it very peaceful and private. 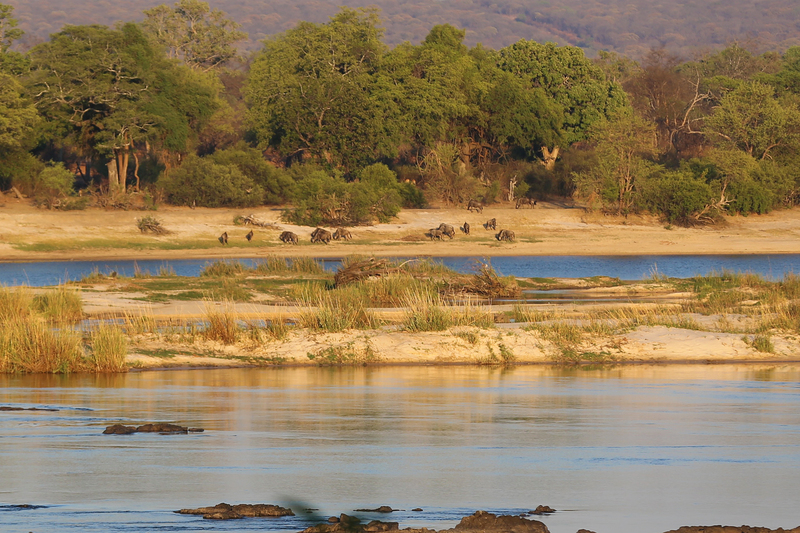 The island is across the river from a Zimbabwean National Park, which is a favorite stomping ground for innumerable exotic species of wild animals. This gives guests the opportunity to look out over their deck and across the magnificent Zambezi River to see hippos, elephants, lions, giraffes, wildebeests, baboons, antelope, zebras, rhinos, and buffalo going about their day in their own natural and beautiful habitat. Priceless! The chalets are set on large and lovely wooden decks and are constructed with canvas siding and a thatched roof. The Zambezi actually flows right beneath the deck of the chalets, often bringing a few of the more water-faring critters with it. The chalets also are open-sided, immersing you in the thick of Mother Nature. 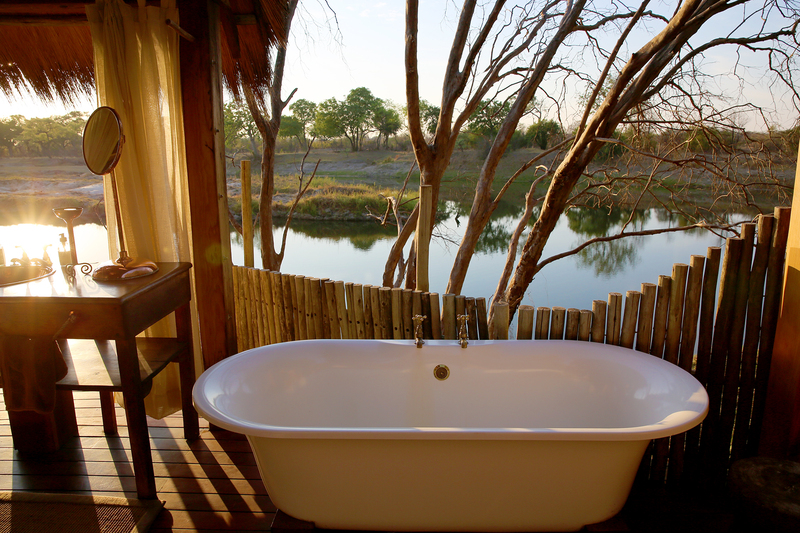 Imagine having a relaxing soak in your tub while being wowed with a view of baboons, zebras, giraffes, and more. You can wake up and see wildlife while still laying in bed, and at night, you’ll be lulled to sleep by the intimate sounds of nature. Each accommodation comes with a personal butler, safe, private deck, complimentary same day laundry service, large open tub/shower facility, bathrobes, and mosquito netting. Yet it is a more rustic and adventurous destination than your typical resort. You won’t find any air conditioning, wifi, spa, pool, salon or fitness center on this glamping expedition. The idea is to immerse yourself in nature. Sindabezi has central communal campfire pit with comfy chairs all around, which makes for a good place to sit, relax and enjoy some good conversation with a sundowner. It also has a central open-sided living room with plush sofas and a variety of board games, books, and a full bar. The whole dining operation at Sindabezi is fabulous. 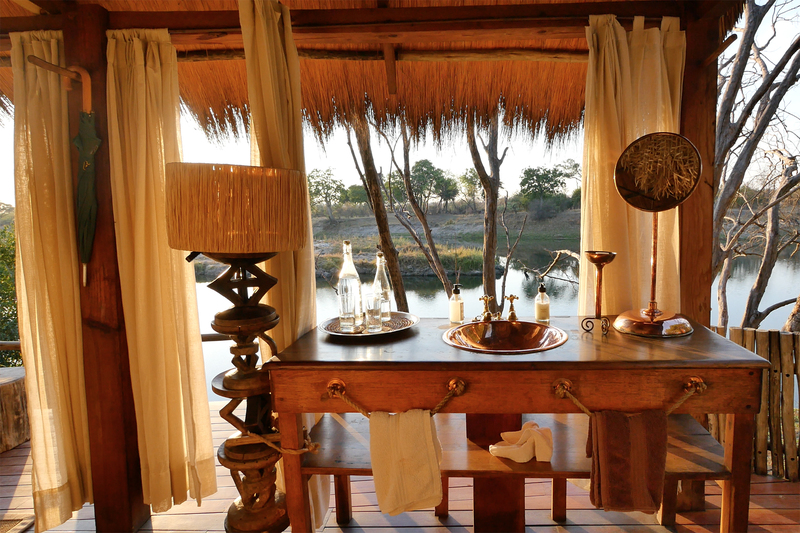 Similar to its sister property, Tongabezi, meals are included in the price of booking. They are cooked to order and consist of the freshest, most flavorful and healthy ingredients. You choose the time and spot where you would like your delicious meal to be set up. Despite the fact that you are camping in the middle of the wild African bush, you’ll be eating as though you were in a 5-star hotel. You can enjoy breakfast in bed, lunch in a platform up in the trees, and dinner in a cozy little candlelit nook on over the water. The food is delicious and menus are catered specifically to the preferences of each guest. Also similar to Tongabezi, I found the staff at Sindabezi to be warm, attentive, friendly and eager to provide guests with whatever they could to ensure a memorable experience. Should you decide to venture off the island, some of the most popular activities include canoeing, guided game drives, sunrise and sunset boat cruises, cultural tours, river safaris, a visit to Victoria Falls, swimming in Devil’s Pool, guided bush walks, fishing, and so much more. I was hosted as a guest of Sindabezi but the opinions expressed in this article are, as always, my own. This place looks incredible! And once again you have created the perfect video to showcase its magnificence! Thanks to this post I now have to add Sindabezi to my bucketlist!!! Oh wow, this looks stunning! I’ll definitely have to pay Sindabezi a visit. 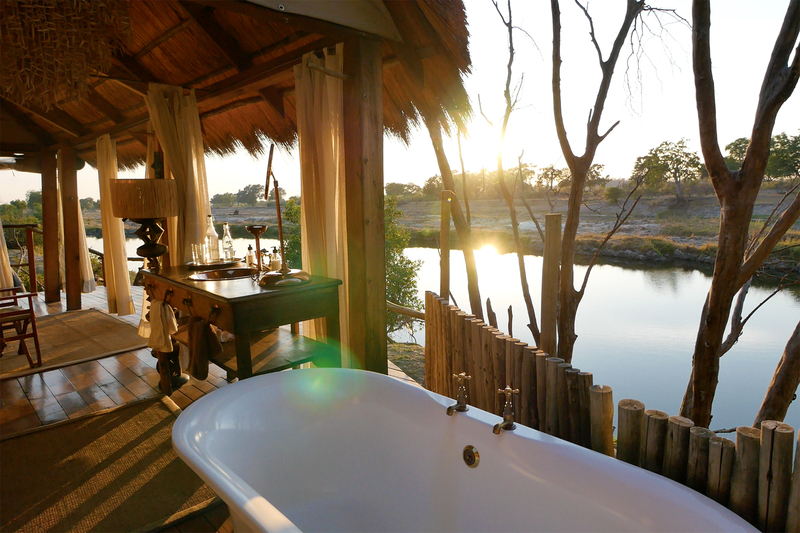 Booked my last couple of trips to Africa with http://wildluxe.com/sindabezi-luxury-zambian-bush-camp/ – couldn’t recommend better!